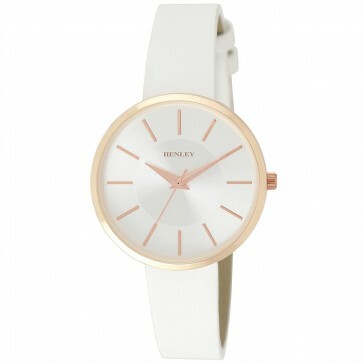 The Henley Women's H06139 is minimal and modern in design. Having no shoulders, the case seamlessly meets the strap to give a really sophisticated look that is bang on trend. This combines well with the minimal index set on the clean sun-ray silver dial. Available in tan, blue and coral. Polished Round Rose Gold Case with no Shoulders - 34mm. Soft Sun-ray Silver Dial with Rose Gold Index.